Philippines, 22 January 2015 – Imagine a set of tyres that can take a driver the grueling distance of approximately two and a half times around the world. The Goodyear Assurance DuraPlus is engineered to let drivers go up to 100,000km¹ and comes reinforced with DuPont™ Kevlar® for added protection, delivering tremendous value through a longer lasting and more durable tyre. Designed for small- to mid-sized passenger vehicles, the Assurance DuraPlus tyre boasts an improved version of Goodyear’s proprietary TredLife Technology™ with a new enhanced tread compound, combined with a DuPont Kevlar overlay for added reinforcing. “With consumer-driven needs at the center of all our tyre innovations, Goodyear Philippines is launching the Assurance DuraPlus, the company’s latest passenger tyre for today’s value-conscious customer,” said Ron Castro, Managing Director for Goodyear Philippines. “We understand that some drivers are looking for a tyre that can take them further with minimal worry. The new Assurance DuraPlus has been designed specifically with these people in mind. Goodyear’s TredLife Technology increases the usable life of the tyre for longer mileage. In the Assurance DuraPlus, it provides up to 100,000km¹ of road travel. The introduction of a DuPont Kevlar overlay into the Assurance DuraPlus increases the tyre’s durability. Used in military grade equipment, this lightweight material maintains stiffness and strength even under high temperature conditions when the tyre is in motion, giving drivers’ added protection against road hazards. 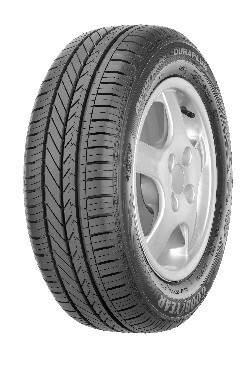 Available in 14″ to 17″ rim diameters, and in multiple sizes for a wide range of small- to mid-sized passenger vehicles, Goodyear Assurance DuraPlus is the tyre to turn to for outstanding mileage and protection. ¹ Tyre mileage projection as tested by Goodyear Testing Division in size 185/65R14 on roads in Thailand and actual mileage may vary due to state of roads, tyre pressure and maintenance, climate, driving styles and usage patterns etc. Distances between cities are estimates of straight point to point distances in kilometers.